A long time ago when I was knee-deep in the dating world, I remember briefly meeting a man who quickly became angry with me. As I described my life, my job, my pets, and my hobbies he said he hated people who lived “inside the box”. As I recall he had enough money, for whatever reason, to live “outside the box”, to spend his time however he pleased. As my brother would say, he didn’t have to “work for the man”. At the time I was puzzled for being so bitingly labeled for living what I thought was a normal life. But I see now that living inside the box got me through to retirement, thank you very much. Now I strive to LOOK outside the box, something I envy the truly artistic, gifted people. Artists see the world through a prism of different colors, shapes and sounds. You could say I’m artistically challenged but that’s no reason to wallow in self-pity. Anyone can challenge themselves to work beyond their limitations, to break out and see what the gifted artists so easily see, to create and maybe photograph the previously unseen beauty of the world. The other day I was wasting time on Facebook looking at Border Collie pictures. On one Border Collie group a man had taken a picture of his dog next to a Christmas tree. But I never saw the dog and the tree, which is unusual for me. My eye was drawn to the wall of pictures in the background. Every inch was filled with framed Border Collie photographs and paintings of all shapes and sizes. I immediately commented to him about his artistic display to which he replied that this is a hobby of his. It was truly inspirational to me. Yet I stopped and asked myself why not emulate his idea, to draw people’s eyes to a display of Border Collie artwork and photos of my dogs when they enter my house. I have the space, a camera and the time. His post pushed me to go out of the box, to not limit myself. Years ago I was addicted to attending estate sales. My secret to finding great deals was to always look up. We enter the outside world looking horizontally or looking down. Sometimes the real deal, the beautiful, the unusual is on the top shelf, or hanging from the ceiling. I learned to look up-out of the box. This is a challenge to myself for 2016, to look out of the box, beyond the usual, the mundane, to open my eyes and see past the things I see every day and ask why and even better, why not: paint, sew, knit, crochet, photograph, write, etc. There is no reason for me to limit myself as being artistically challenged but to embrace the gifts I do have; to learn, to try, to look and step out of the box. 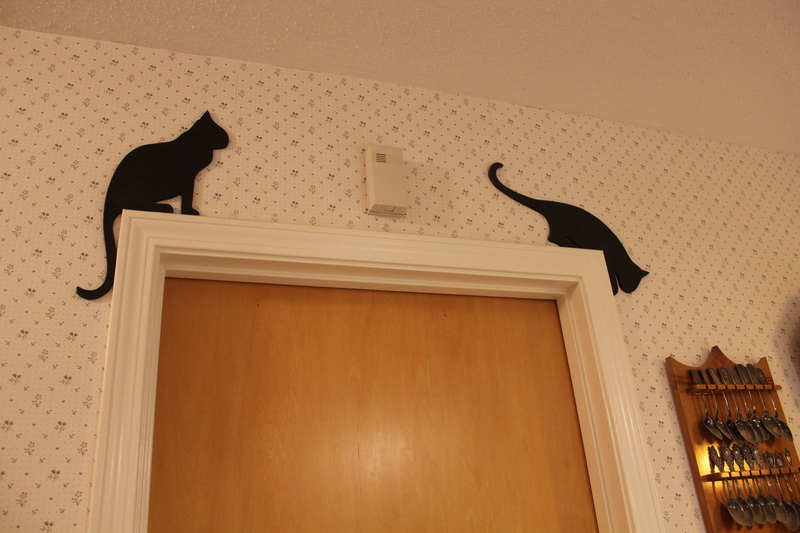 Most people don’t see the wooden cats above the door. Would you? This entry was posted in Art, border collies, photography and tagged Art, artistic people, Border Collie artwork, out of the box. Bookmark the permalink. Go for it! Boxes are invisible constrictions of our own making which may protect us from scary stuff beyond our comprehension, but also blind us to immense growth available to our spirits, when we start to look beyond. Looking forward to hearing more.